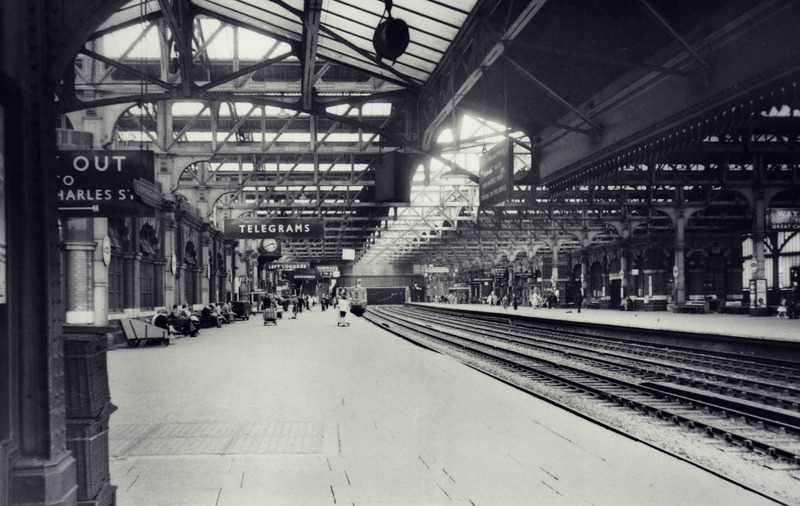 This fine Edwardian station was demolished in 1977 despite a public outcry. The historic fabric was razed and trains on the old Great Western line to Leamington were terminated at Moor Street – originally devised as an overflow station for Snow Hill. However, the damage to cross-city services was so severe that the station was rebuilt, in a smaller, far more utilitarian idiom, in 1987 – a mere ten years after the station had disappeared. 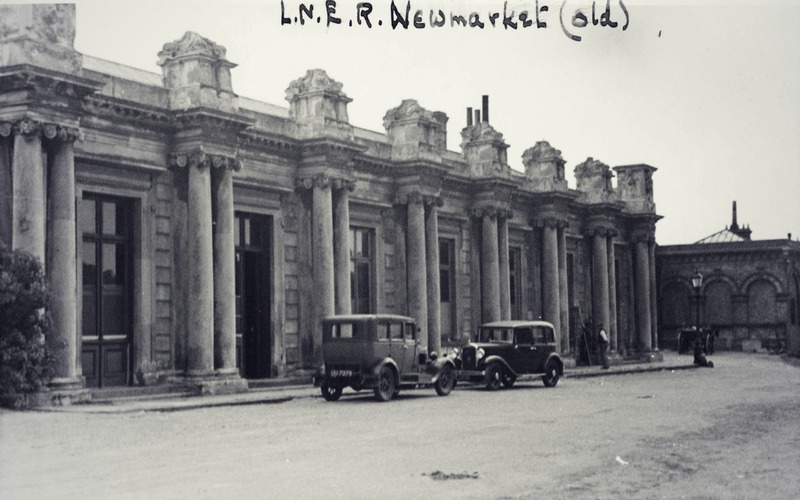 The unique Newmarket Station of 1848 had an imposing facade comprising a colonnade of eight sets of paired Ionic columns topped with massive entablature plinths and finials. 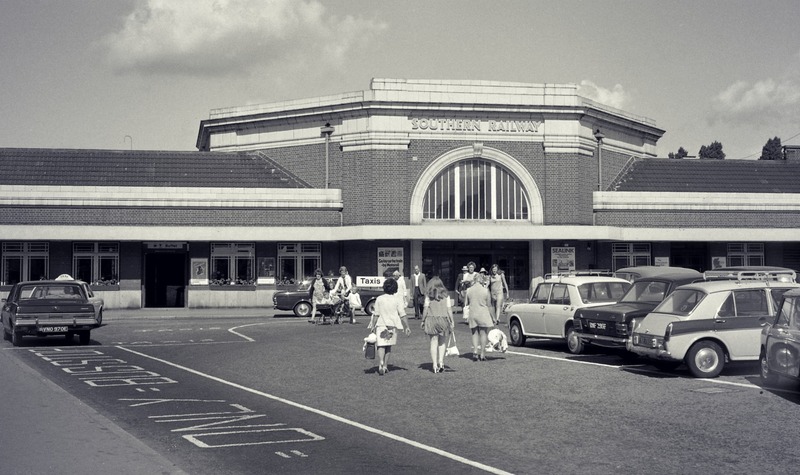 Closed in 1967, the station buildings survived until 1980 – when, despite their listed status, they were regrettably demolished. Today the site is a housing development. 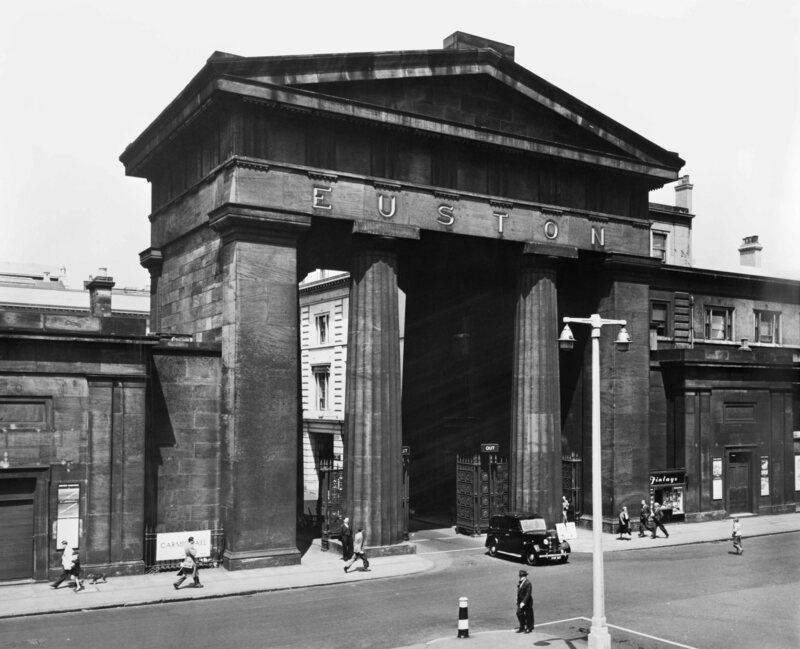 The most celebrated of all Britain’s railway monuments, the severe, Doric, pedimented Euston Arch was not strictly an arch but actually a 72-foot entrance gateway to a courtyard. Completed in May 1838 and costing £35,000, it prompted the functionalist developer-architect Lewis Cubitt to comment that ‘a good station could be built at King’s Cross for less than the cost of the ornamental archway at Euston Square’. Despite the Euston Arch’s worldwide renown as perhaps the most potent symbol of Britain’s Victorian industrial achievements, demolition of the Arch began on 6 November 1961. This fabulous Arts and Crafts extravaganza at Mundesley-on-Sea, built in 1898, had half-timbered gabled pavilions connected by a graceful, balustrade wooden arcade. Its steeply-pitched roof was punctuated by chunky chimneystacks and a slender clock tower with a cupola. 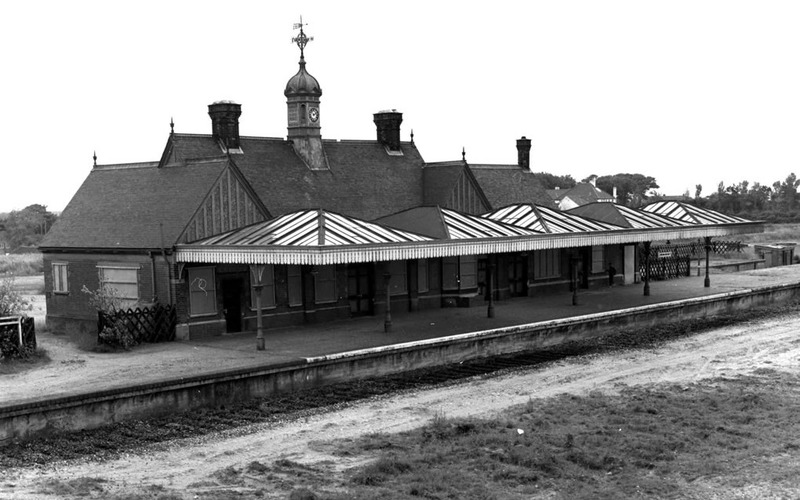 It was demolished following the closure in 1964, as a result of Beeching’s recommendations. 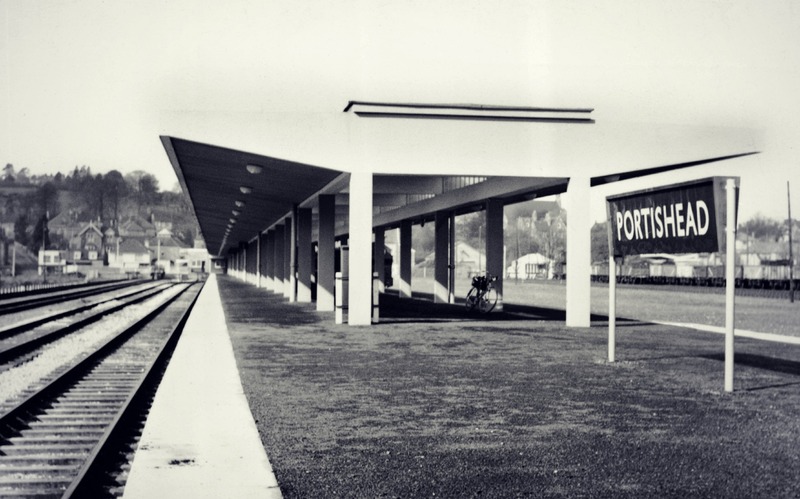 The influence of minimalist Modernism was unmistakable at Hastings Station, built in 1931. 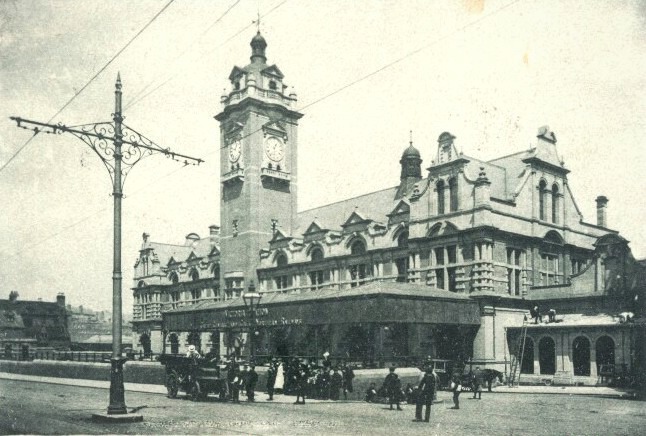 Rebuilt to complement and advertise the new, electrified lines introduced by the Southern’s Chief Engineer, A W Szlumper, its giant entrance porch was furnished with a single, large lunette window – a motif that had become an internationally-recognised symbol for the railway station at the turn of the twentieth century. 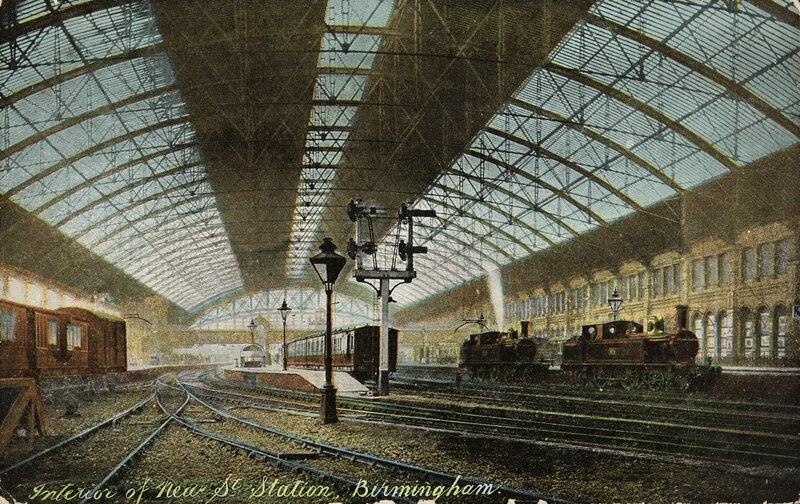 The splendid trainshed roof at Birmingham New Street had been badly damaged by bombing in 1940, and all traces of the Victorian station were later demolished rather than rebuilt. The ‘new’ New Street found few admirers: Country Life’s readers voted it the second worst eyesore in the nation in 2003. 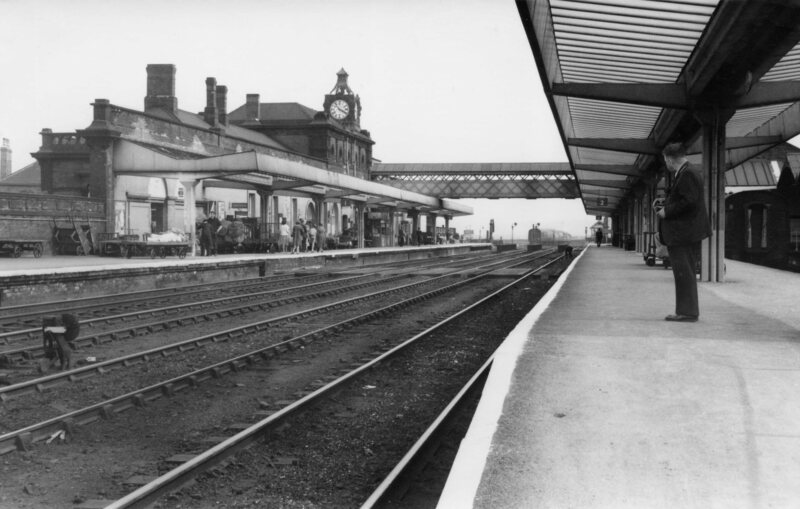 This quirky, confident station at Wakefield Westgate, built in 1867, had been provided with one of the most eccentric clock towers in the country: a fusion of Art Nouveau and Gothic styles, 97 feet high, and decorated with a cast-iron lantern and a gilded weathervane. The late 1960s was no time for such architectural fun, however, and Westgate was ruthlessly rationalised and downsized. Nottingham Victoria, of 1900, was a riot of Jacobethan and Baroque motifs: Dutch gable ends, pedimented gables, heavily-rusticated columns, a wooden cupola and open, segmental pediments all competed joyously for attention. After the station closed for business in September 1967, almost the whole site was flattened to make way for a shopping centre, in the middle of which the station’s cheerfully eclectic clock tower now stands marooned. Reblogged this on Hetty Startup, at Wellspring House. Such a shame to see them left like this. The loss of key stations at New Street and Euston, and their subsequent replacements, were a crime against humanity. That they were replaced with such gargantuan structures is abhorrent! Sprawling Manors Station, in Newcastle=upon-Tyne, has disappeared and replaced, in part, by an underground Metro station. You forgot Bradford Exchange, an architectural loss if ever there was one! What a magnificent station Birmingham Snow Hill was. Spent many happy hours there in the early 1960’s trainspotting with friends from Sheffield. How on earth could demolition of such a fine structure be deemed to be justified. Scandalous. Why New Street? What about Birmingham’s Curzon Street, the nice bits of which are still standing. I have never liked New Street. I think I read recently that Curzon Street is to be refurbished and used by HS2. Anyone remember Leeds Central Station? our town lost a fantastic Victorian station entrance years ago thanks to the council to be replaced by an eyesore. will we ever say this about the unopened tesco stores that are now stood still??!! Birmingham Curzon Street was the corresponding end of the GWR Line from the Euston Arch. It is now in a poor state at the side of the goods yard. It is to become the Birmingham end of HS2 so hopefully the building will be refurbished. Yes I remember Kenilworth Station in Warwickshire now a group of houses lost when Beeching got rid of a lot of railways they are talking about re-opening one some where in the common area. They should have left well alone luckerly I have memories and photo’s of it. So sad to see so many “own goals” architecturally. We are our own worst enemies when it comes to what we think are “improvements.” As a Midlander i am particularly grieved about Snow Hill, which was part of my Boy-hood, and the other Birmingham stations. Have you seen the current New Street Station ? Platform ! of Southampton Central and its clock-tower disappeared mid-60s and was replaced by an office block. I am a great admirer of the work of Richard Seifert, and have recently written a blog on him, with mention of Euston. The Seifert Euston should be listed and preserved, and I urge Historic England to consider this. I have used Euston and it is a humane and pleasant place, with stunning and striking black granite buildings. Let us preserve the best of the 20th century, and the station is still practical and good looking. It does what it was designed to do! The old brick station at Tamworth was fantastic pure class of building skills all gone see it now just plain old single story pure rubbish no style shame on the council of the time to demolish the old station they say need to attract more people to see Tamworth the only thing left is the castle pulled all the rest down as is the town. A great set of tragedies. Especially Snow Hill – as a native of West Bromwich it was the setting off point for many-a family holiday not to mention my train spotting well into my teens. How much have we learnt? The ‘other end’ of the Euston Arch is Curson Street railway station in Birmingham, a grade 1 listed building with no proposed use and currently ‘at risk’. Something needs to be done to identify a use for this building at the heart of the site intended to hold the HS2 terminal. What about Birkenhead Woodside station terminus of the former GWR London Paddington to Birkenhead route a fine example of Victorian Rail architecture, lost in the late 60,s. I agree with the selections, great mixture of designs, how about Birkenhead Woodside a fine example of Victorian architecture, terminus of the old GWR London Paddington to Birkenhead Route sadly closed in 1967 and demolished soon afterwards. Love railways, and especially old stations. “The most celebrated of all Britain’s railway monuments” The Euston Arch? Since when and in who’s opinion? Sounds like blatant Metropolitan bias to me. Maybe one of London’s, but not Britain’s. Get a grip please.